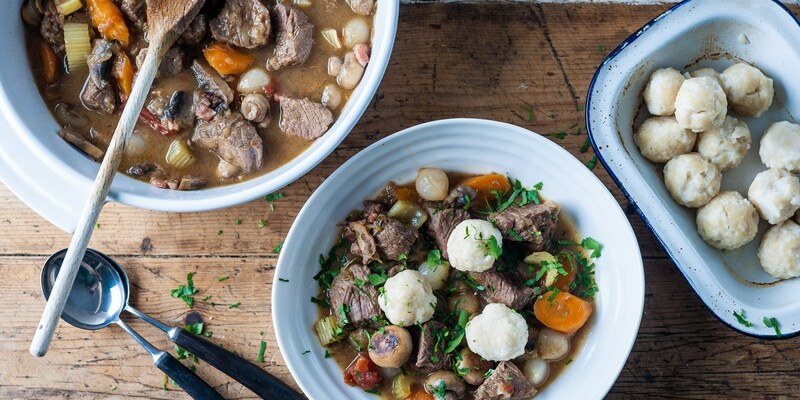 There are few things more satisfying than a chunky, warming stew on a chilly day. With a varied selection of meat and fish stews, this comforting collection of stew recipes is sure to appeal. Nathan Outlaw's rustic seafood stew recipe combines pollack, squid and mussels with the strong flavours of tarragon, garlic and tomatoes to stunning effect, while Shaun Hill is a touch more traditional with his offering; a beef stew recipe with mash potato and leeks - perfect for the whole family. Stews don't simply have to stick to a traditional base – chefs add plenty of ingredients to their stews for plenty of intrigue. William Drabble's lamb stew recipe is packed with pearl barley for a super-comforting finish, while Franceso Mazzei's Rabbit cacciatore recipe is flavoured with pancetta and olives for a beautiful rustic Italian flavour. Not all stews have to be meaty affairs – James Mackenzie serves his Vegetable and chestnut stew recipe with a sage crust, while Food Urchin serves the classic Italian vegetable stew caponata on bruschetta for a more refined take on the dish.